Oh! It’s my first blog post in over a month. I have been very busy, mainly working on BMX-based animation sequences for this – One Way Up 3D – but unlike last year, I’ve found that the busyness hasn’t overwhelmed me. I haven’t had to drop everything else to focus solely on animating (although I have dropped quite a lot of sleep). I’ve been making time for other things and other people to fit along side the demands of an animation project. 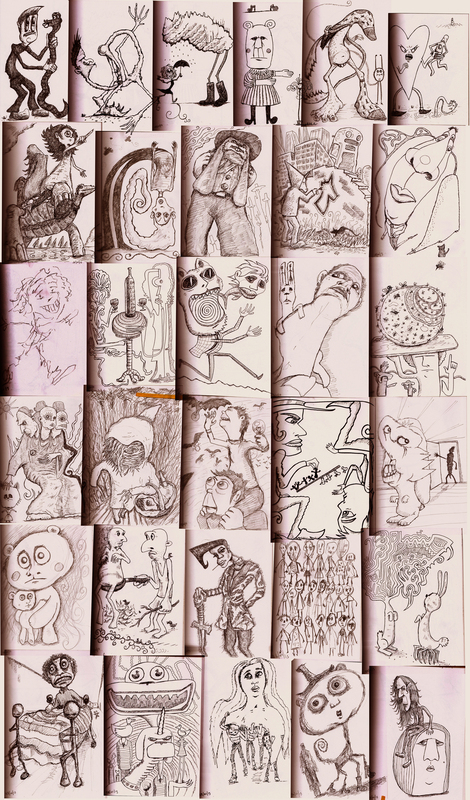 On Monday’s I’ve been delivering this course – Drawing from the Imagination – and every day this year so far I’ve drawn a kind of ‘daily doodle’. It’s been challenging to be so disciplined to do this kind of drawing everyday (especially on days when I’ve already done 100 or so drawings for animation), but also it is so relaxing, letting go and drawing without expectations, finding a path into an image and exploring. It is like yoga. I expect. This entry was posted in Animation, Education, Illustration and tagged Doodles. Bookmark the permalink.